There has been a lot of talk within the past month of just how much pain us Kansas City Royals fans can take. The Royals just wrapped up an awful 7-19 July, pushing fans even closer to the edge. It’s easy to sit there and just say ‘What’s new? The Royals are always bad!’, but this season goes deeper than that. It’s not just about winning and losing. It now becomes an issue of at what point do we, as fans, say enough is enough. Just what would it take to reach our tipping point? I still remember the summer of 1994 fondly. That summer, I got my first real job. I also got my first vehicle, even if someone ran me off the road and totaled it less than a month later. It was also the summer of the baseball strike, and before that happened, the Royals were making a push. Manager Hal McRae was leading Kansas City up the standings, eventually getting the Royals to third place in the American League Central, only 4 games out of first place. 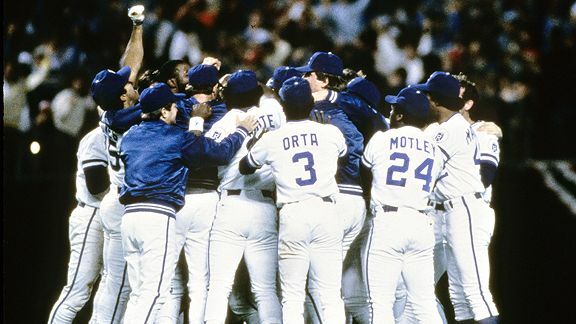 When the strike happened, the Royals sat at 64-51, and it seemed the sky was the limit for Kansas City, as they were red hot. But it was not meant to be, as the strike forced the commissioner to call the season done, including no World Series that year. To make matters worse, Hal McRae was fired that offseason, being replaced by Bob Boone. That should of been a sign of what was to come, as the slide downward of our Royals began at that point. In fact, since 1995, the Royals have had only one season above .500. One season, 2003. That is it. Outside of that, there has been no joy in Mudville. Seventeen seasons of losing, which is enough to make a normal man hand in his Royal blue hat and find another team to cheer on. But we are a sadistic bunch, as we continue to take the abuse. In 2006, it seemed a ray of light shined on us, as Dayton Moore was hired as the General Manager. Or so we thought. Dayton Moore coming in gave us faith that he could turn around the Royals. Moore had been a scout in the Atlanta Braves organization for years, moving up the ladder in Atlanta, sitting under the learning tree of former Royals GM John Schuerholz. Moore had the reputation of having a great eye for young talent, which is what the Royals needed. Moore’s first task was to build Kansas City’s farm system back up, as it had been depleted for years. Six years later, it is safe to say that he has done that. But being a GM isn’t just about developing young talent. It’s also about acquiring veteran talent that you can piece together with the youngsters to mold your team. That is where Moore has lacked. A finger can be pointed at Moore and Owner David Glass for how the past few years have gone for the Royals. Going into this season, the young players were to continue to grow and we would at least see improvement within the team. Unfortunately, the wheels started to come off the cart in February, as injuries started to pile up. More injuries occurred once the season began, and add in bad roster choices and a rotation with 5 bottom rung starters, and you have a team that is back in the basement of the American League Central. Through it all, we fans continue to watch. But what would it take for us to turn our backs on our team? The easy answer to this is for the team to continue to lose. The Royals have lost a lot of fans over the past eighteen years, and the longer the losing continues, the more fans don’t care anymore. They always gain new, younger fans. My son is the perfect example. He used to not care what happened with the Royals. Now, he wants to know everything that goes in with the team. The team will always gain fans like this, but keeping them will be the hard part, and the best way to do that is to win. Winning gets you more fans than you even need. Ask the Yankees. Winning makes all the bad that we have endured go away. In the end, that is the real answer. To be truthful, the tipping point would be if the team continued following the path they are now. Continuing to act like nothing is wrong, that all is fine, will make fans even more apathetic, as it gives across the feeling that management doesn’t care about this team, nor does it care about its fans. This is a good way to alienate the fanbase, and it’s doing the trick at the moment. Many a fan has stepped away from this season and is already looking forward to the upcoming Chiefs season. That is not a good sign. If they go into the offseason with that same attitude, and don’t upgrade this team, then next season will not be pretty. Fans will not flock to the K, and David Glass seems to think if the stands are empty, then there is no reason to spend money. It’s actually the opposite; if there are no fans, you need to give them a reason to attend the games. You can’t just hope that they will come on name alone. Not with all the losing we have seen over the years. The first time the Royals broke my heart was in December of 1991. Longtime team ace Bret Saberhagen was traded to the New York Mets, and I was crushed. Sabs was one of my favorites, and one of the players connected with my initial love of the team. Now he was gone, and no matter what we got back, it wasn’t enough. Trades happen in baseball, and I realize that now. But to a kid, it’s not that simple. Twenty one years later, and I now can’t even count how many times this team has broke my heart, even by management just not trying. I’d like to say I would never walk away and be done with the team I’ve loved since I was a kid. But it’s tough to watch your team lose year after year, with no end in sight. We need a sign, maybe even a miracle. Either way, something has to happen, and has to happen soon.